The centerboard is completely rotten and in 4 pieces. My plan was to piece them back together to make a template. Then use the template to make a new one. What I can't figure out is how it attaches to the boat? The roller furling seems a little confusing too. There is a white pvc pipe with 2 rusty hose clamps one on either end. Not really sure how it works or if it could be updated with a newer device? Last concern is the rubber gasket around the opening for the centerboard. Not sure if that should be replaced to prevent any potential leaking? The rubber itself seems pretty good, not too dry. Hopefully a good Bucc owner will pipe in soon and help you out but for now, have you found our main page where we have documents for most of these boats? 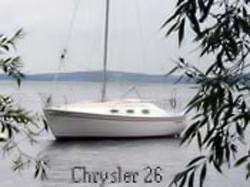 Try chryslersailors.com and follow the document link. you will find a 12 page document describing your Buc 18 in detail! Feel free to download and print for your reference! Thanks Scott, the documents are a great help. Hopefully with a little more help I should be out on the water in no time! The buccaneer world is a little spread out Look at www.buccaneer18.org for a jump off point. Set yourself up with a Facebook account and get to the Buccaneer classifieds for used parts. Also get set up with the Mutineer group as the boats share lots of parts. Yahoo groups is where some boat-specific conversation is to be had but it's not super-active past Buccaneer Regatta notices. The centerboard on a Chrysler Bucc is loaded through the bottom with two mounts screwed in the centerboard slot. The top mount conversion uses long mounts that can be removed from the top side. Nice if yu race and want easy access to CB removal. Ceterboard seals are available through many dinghy racing catalogs and can be glued on with 3M 4200 or the original aluminum slot cover can be re-used. Lots of guides and pictures on the Yahoo groups for Buccaneers and the yahoo group for Mutineers. Many new parts are still available new through www.nicklesboats.com. who still produce a variant of the Chrysler 18 today. I know this is an old thread but maybe it'll help the next Bucc sailor! Bucc 18 - Millennium Falcon "The fastest hunk of junk in the galaxy!"